For the arch-Heathen, reputation was incredibly important. An argument can be made that it was so because fame is a person’s route to immortality. If your name, like Galileo’s, lives on in the minds of other men for all time, you are immortal. If your name is immortal, so is the name of your kin. At the time, there were few better ways to serve those kin. Fame is commonly found in the primary sources, and is a reference to “good reputation.” Although the dictionary definition is accurate, today’s version of “fame” is to be famous, popular, or simply well-known. For the arch-Heathen, fame almost always seems to be in relation to a good and honorable deeds. 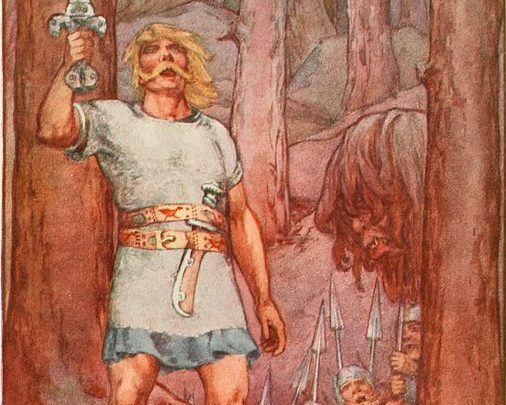 Beowulf’s good reputation was certainly based in his deeds, and it helped him and his kin to thrive. Fame (good reputation) is directly related to honor. Fame is indirectly related to frith and luck via that honor. Fame is a form of social currency, as is worth. While worth is a currency you maintain with your inner-yard, fame is earned and spent via the outer-yard. Fame relies on a similarity of honor codes between groups of people. For example, Mr. Donnely leads a local youth group, and your daughter benefits from his leadership. He leads this group because his tribe believes that doing so is honorable. Because you find this service valuable and important, your tribe’s honor aligns with his, and thus his actions are considered honorable by your tribe. Mr. Donnely’s fame has become more in your eyes and you will speak of him kindly. His honor grows, and his luck is sure to follow. On the other hand, ill-fame may bring misfortune. If Mr. Donnely is known to be someone who instigates bar fights, and your tribe views that behavior as dishonorable, you may not wish him to lead a youth group that involves your children. A poor reputation, whether of the individual or the tribe, could lead to other tribes refusing to associate with them. There are many ways this could be detrimental. It is also important to note that your fame is not completely under your own control. If another group’s sense of honor differs from your own, you are certain to have differing opinions of the other’s reputation. For example, Mr. Donnely’s tribe believes it to be honorable to support the building of an Asatru Hof in Iceland and your tribe does not. It doesn’t matter how fierce their support of that effort is, your tribe will not acknowledge any increased reputation from that action. However, if the Farout Hearth believes it is an honorable endeavor, the reputation of Mr. Donnely’s tribe will increase in their eyes. Fame is therefore not equivalent among different groups of people. Despite how (un)fortunate this can be, it is the basis for what forms our social reality. It is also universal in that one need not be Heathen to be subject to it. Intent and belief are far less important that the deed itself. It is easy to forget that fame and renown are concerned with deeds, and not thought or belief. It does not matter why Mr. Donnely decided to lead your daughter’s group. It matters that the deed was found honorable by your tribe. Unless the intent is clearly stated by the person committing the act, then it is completely valueless in determining reputation. Conjecture and assumption are dangerous bedfellows. One must be careful in making claims against the reputation of another. Modern defamation law is evidence of this; we do not allow people to libel or slander another. Harming another’s reputation may often result in actual monetary damages, which modern courts assess if such cases are won. This has its roots in archaic times, where the punishment was severe. If a person was to speak slander during the official proceedings of thing, the early laws of Iceland mandated that the punishment would be full outlawry, which was frequently akin to a death sentence. This is further evidence of the importance of fame and reputation. Fame not only means immortality, but it will certainly increase the honor, frith, and luck of the tribe. A fame renown throughout the land will bring many people to your side in times of need. We know that worth can be enhanced by association, so too is fame. If you have great fame there will be many chances for you to engage outer-yard individuals and tribes in the gifting cycle, thus bringing wealth to your tribe. You can be sure that people will be more likely to do business with you as well. Take care of the reputation of your tribe and ensure that your inner-yard takes care of it too. Stay true to the honor of your tribe and act boldly when you know you are acting in right good will. Those who will find and maintain fair fame by this measure may well be remembered forever.